Whether you're an adventure-seeker, a nature lover, a culture-hound, a luxury traveler or all of the above, Canada has an experience to fulfill all your travel dreams. Travel by train or motorcoach, track polar bears, or wind your way through the Rockies, we can plan the perfect trip. Canada’s vast wilderness allows for infinite Wildlife Encounters. We offer itineraries that are designed to facilitate unrivalled experiences in the wild, and bring travellers up close and personal with grizzly and brown bears, belugas, orcas, polar bears and more. Whether you want to ski the Rockies, ice skate in Lake Louise, go trout fishing in Great Slave Lake, take a sleigh ride in Whistler or visit the remote Nimmo Bay wilderness resort, let a Canada travel specialist handle all of the details. You can experience Canada by sea or land, whether by tour or cruise. Most cruises to Eastern Canada begin in either Boston or New York, up to Maine, and through the St. Lawrence River in Quebec. There are also tours to both Eastern & Western Canada. On any of the amazing escorted Canada tours showcased here, you will experience magnificent scenery, stunning mountains, cosmopolitan cities, world-class resorts and more! If you're looking for a wonderful collection of escorted Canada tour packages that offer itineraries to both eastern and western Canada, look no further... Escorted Canada tours range from four day Calgary Stampede tours all the way to twenty-six day journeys that stem from eastern to western Canada. These escorted Canada tours consist of hotel accommodations, sightseeing, meals, and transportation. You can also choose from a large selection of Canada hotels and Canada cruises. As the second largest country in the world, Canada is a land of pristine wilderness frontiers and bustling modern metropolises. 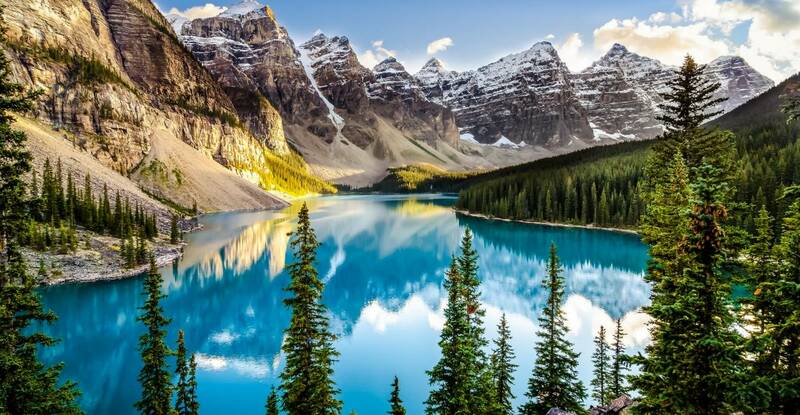 Stretching from the Atlantic to the Pacific, and as far north as the Arctic Circle, Canada includes majestic mountain ranges, sparkling lakes and rivers, unique cultures and vibrant cities. Few countries in the world offer as many choices to the traveler as Canada. Now vacationing in Canada is even easier, as we have done all the work for you. Choose from escorted tours of Canada, vacation packages to Canada, rail journeys and cruises. There are so many ways to travel while in Canada. Ride the rails in elegant comfort on a Canadian adventure from Toronto through the Rockies on the popular Trans-Canada by Train tour or the Rocky Mountaineer Escape from Vancouver. Thrill to the excitement of the famous Calgary Stampede. Explore French Canadian history and culture in Quebec. Cruise along the Canada's coasts, lakes and rivers. All this makes Canada one of the most exciting travel destinations in the world. Keep in mind when planning your Canada tour that peak season is May to September as the weather is most enjoyable. Gail is excellent! She knows her business, and is great about explaining the trip. I give her high marks! It was good experience working with Atlas, thank you - we are excited for our vacation! Brenda was prompt and timely with all we asked of her. And very, very pleasant as well. Very knowledgable concerning the insurance question we had. It was all good and Brenda was patient and professional Great experience. Alex responded promptly and I was very pleased with the professional service. Thanks! Alex is very responsive and professional. The level of service exceeded my expectations. I will use you again and refer your company to others. Brenda was on the ball because she realized I had booked my departure incorrectly and was flying into the wrong airport for the tour. She called me at home and I was able to correct it with the airline at no additional cost to me. I was very thankful ! Gabriela has been helpful &amp; very prompt in providing information about Antarctica trip. We are definitely joining the trip, pending the timing. Are you an avid skier and looking to hit the slopes this winter? Everyone knows about Montreal and Toronto, but find out about Canada's most unheard of, exciting destinations.